RP Tools Map Tools – but rarely do they have the same visceral impact of using awesome terrain at the table. That’s why coming across Tabletop Simulator excited the game master in me. Tabletop Simulator is exactly what it sounds like. It simulates a tabletop with physics and motion, allowing you to use pieces to physically recreate games. It doesn’t have rules for games programmed in, instead it simulates hand movements through mouse clicks. Combined with the built in boards, pieces, and chips, you can recreate any game played on a tabletop. Chess, checkers, backgammon, cards are all pieces you can click and move around as if you were in front of an actual table. You can shuffle and deal cards, move pieces around the boards, and pick up and roll dice. 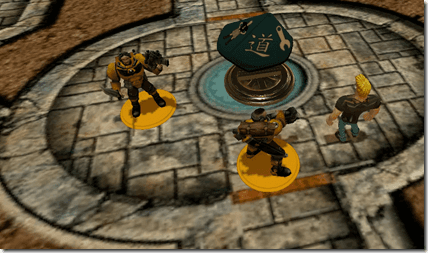 Built in to the base simulator is an RPG Kit, with tokens and 3d models to simulate terrain, walls, and miniatures, allowing you to create tabletop terrain and move minis around it. The features of the RPG Kit models, terrain pieces, and the layouts of the boards you can load in are all aimed at simulating the feel of an RPG tabletop. 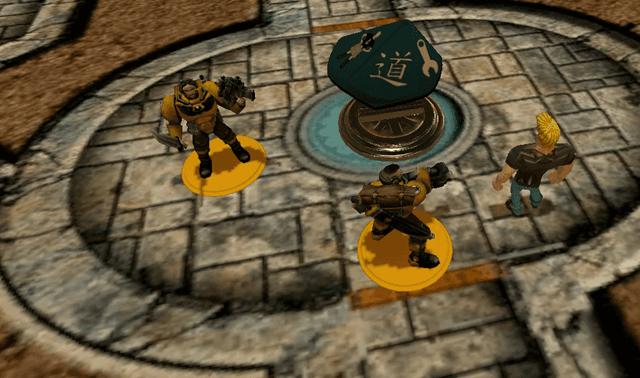 The elements built into the base program are pretty fun and could create some interesting tabletop experiences online, but the Tabletop Simulator was built with modders in mind. It has the ability to load in your own custom models and pieces, enabling a near limitless number of options for tabletop terrain. Doing something as simple as creating a custom table and loading in an image of a map, then adding models and some rocks really provides an immersive experience. Those are just a few from the over 3,932 mods available. A quick search showed about 500 of them were specifically RPG themed, but many models and options can be scaled and used in your game. Here is a screenshot and a brief video showing custom objects that were imported from the workshop. A Johnny Bravo model, some Warhammer models converted and loaded into the steam workshop, and a custom figure flat from the RPG Kit with a logo from my website. 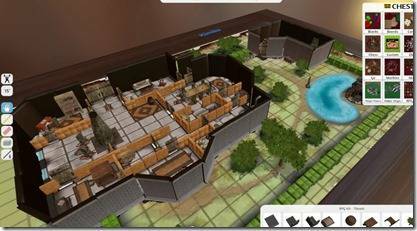 As mentioned above, Tabletop Simulator doesn’t simulate games, just the physical space. It’s a little clunky to use until you get the hang of it, but it provides a really visceral and immersive option for terrain if you can find the right pieces. It runs somewhat slowly on my computer, especially when I am loading in a new mod. Everything is pulled down from online the first time you use it and there wasn’t an option to insert simple images from your computer, at least not that I could find. Once mods and options are downloaded, they are stored on your computer. The plethora of mods are great, and with a little practice it can be a great addition to an online game. You can have other players connect in through their own copies, even hiding things with a fog of war from all but the “host”. The players can then move the table around as they want and zoom at their leisure, but a screenshare would enable the Game Master to have more control of the camera and the options. One element that I can’t determine the pro/con nature of is the mod community and copyright. The great diversity and options allow incredible additions to the plethora of pieces and tiles available to recreate gaming experiences, but this goes hand in hand with major copyright violations. Modders have recreated entire card games and decks with the load image onto card features. While this is awesome in that it can resurrect games that are unable to be played otherwise (a card game from Final Fantasy 9 was recreated in Tabletop Simulator) it also creates fertile ground for major violations, like the sets of Magic or Pokemon cards that are available for download. There are many board and card games available on the workshop (Hero Quest, Munchkin, Descent, and Doom to name a few) and these have some awesome pieces to grab for making terrain, but there are also complete sets of Warhammer miniatures available, which would negate or hinder Game’s Workshop (as an example) from selling their own DLC of Warhammer miniatures for this or a similar type of product. I’m conflicted over this, because I love the options people are making and I’m glad I can use them in my games, but that doesn’t change how it closes off these avenues for other companies in the future. I’m a little bit in love with this program, despite a few clunky areas (for my use) and flaws. The open nature of the modding community is something that I think is much more beneficial than it is harmful, at least in the here and now. Using the program effectively would require a fair amount of setup time beforehand, much like any impressive terrain options you would use at the table. 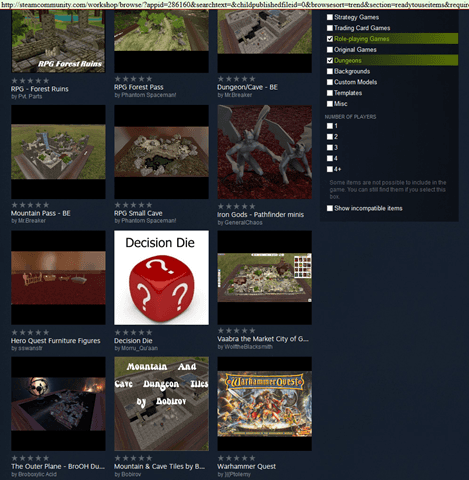 There are a multitude of uses I can see for Tabletop Simulator even outside of its original scope. You could set up a few pieces of terrain and get screenshots, or take a small video, to emphasize the way an area looks and feels. You could create a center piece (such as a tower or an idol) that sits in the middle of the virtual table while playing a very narrative game online. You could even create cards for a custom card game and use those as an immersive element for a short quest, even if you don’t use the full suite of features. Finally, this is the sort of tool that requires seeing it in action to really understand how it works. I’ve played around with it for a brief amount of time and then made a quick overview video. There are a slew of videos out there that go in-depth and they are well worth the watch to determine how to use the RPG functions and see what is possible. What do you think of programs like this? Would you use this to supplement your online gaming? Would this be useful to you when you are doing in person gaming to create interesting terrain? Great review. A couple people in my gaming group have mentioned several times that they want to try a program like this. I’ll definitely point it out to them as well as checking it out myself. Great review! I’m going to have to check this out. I have been dabbling in different programs to use with our Fyxt RPG games. It’s great and digitally handles the mechanics of gaming. Just needed that good tabletop simulator to play remotely and set up something cool with friends. I am really interested in this one due to the heavy modder community. I am also a modder and it would rock to make custom content for it!